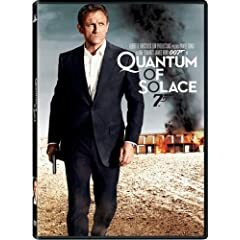 The latest James Bond film, Quantum of Solace, is released tomorow, along with Blu-ray editions of Goldfinger, Moonraker, and The World Is Not Enough. Other feature films in stores tomorrow include the Criterion Collection edition of Francois Truffaut's The Last Metro and Ingrid Bergman's stunning portrayal of Golda Meir, A Woman Called Golda. Andy Richter Controls the Universe is one of the funniest sitcoms ever (Andy Richter is a comedy genius), and the entire series (all 19 episodes) is out this week. Other notable television series releases include the third season of The Venture Bros. and the first season of the Scottish detective series Taggart.